Exploring the scenic beauty of Victoria's Great Ocean Road is definitely the road trip. 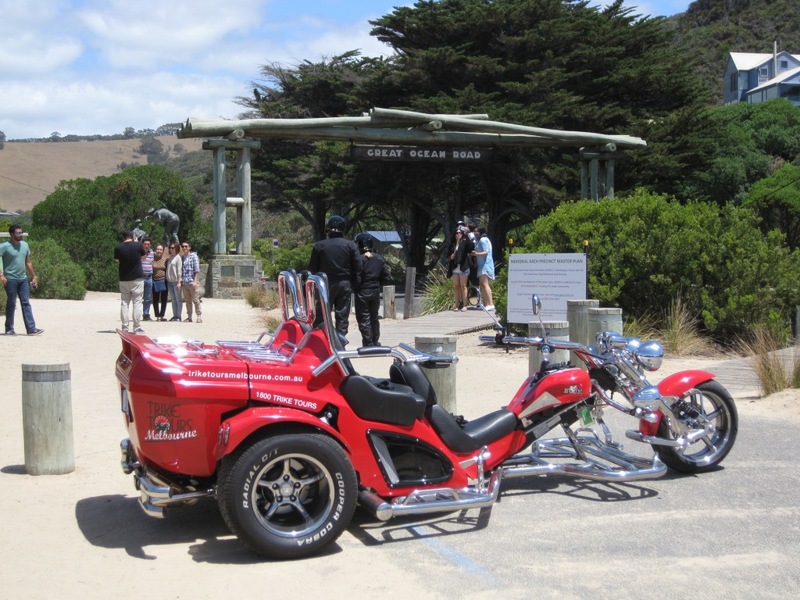 At Trike Tours Melbourne we want you to experience the rush, but not rush the experience so we've decided that a little bit longer for this tour is essential to allow you time to experience, and not just view, the sights. You'll quickly discover why this region is Victoria's holiday destination of choice. Take in the sights from our luxury Boom Trike on the winding cliff tops as we travel the great road - there's time to wander down to some of the beaches or look for Koalas in the wild. We start at the beginning of the Great Ocean Road at Torquay and visit various locations including Winki Pop and Bell's Beach before proceeding to Anglesea, Airey's Inlet, Fairhaven, Lorne and Apollo Bay where we take a break before returning. We visit numerous lookouts and other locations - such as Erskine Falls - to provide you with a diverse day and we work with you in determining how much time you spend in various idyllic locations. It's all about the ride and the road on this trip with stops along the way to take in the breathtaking views. Do not forget your camera! If you'd like to explore more of this area, consider our 10 or 12 hour Trike Tour Hire options. This allows you to extend this tour and have more time to see and absorb the sights, take a swim or a longer lunch, or explore some of the surrounding areas without necessarily adding more kilometres to travel. There's rain forests, waterfalls, breathtaking walks, lookouts, and more to see. There are a number of beaches and locations you can choose to stop at on this tour, including for your lunch - it's entirely your choice within the time frame. Due to the nature of the road we'll have to adapt as conditions require, and usually return through the coastal ranges and the Princes Highway. This service departs from our Southbank office location. Please be at your departure point 30 minutes before the scheduled departure time for your Induction procedure and safety gear fitting (e.g. helmets). Wearing a helmet is mandatory by law and we provide the use of a clean, approved helmet. Our booking process requires you to enter your helmet size when booking. You will be fitted at the office with a helmet from our full range of sizes from XS (extra small) to 2XL (2 extra large). If you have any questions on any issue please don't hesitate to call us on 1800 TRIKE TOURS (1800 874 538) and our staff can assist you. Thank you.